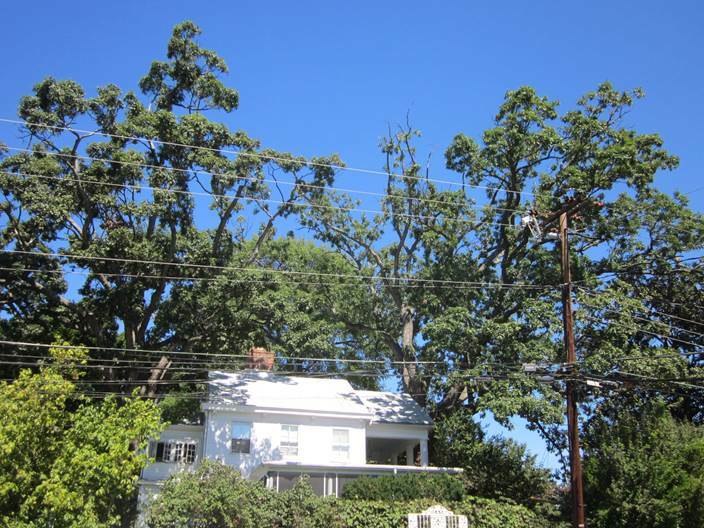 I and others have recently received inquiries regarding cases of oak decline and death throughout Arlington County and the City of Alexandria, Virginia – oak species (Quercus spp.) being the dominant and characteristic trees of the upland landscape in both jurisdictions. In all cases over the years, I have not seen any evidence of disease as the primary cause of decline or death, such as Sudden Oak Death, etc., but rather a combination of factors that are new to the greater region since the mid-20th century as a result of urbanization and changing values. Most of the mature oaks we see in yards and along old neighborhoods and sections of cities are remnants of native forested areas dominated by upland oaks that were present and mature when the houses and streets were built. Upland oaks can tolerate the successive periods of drought and heat likely associated with climate change, but they cannot tolerate significant water table drops and loss of groundwater infiltration around their root zones that result from the now-constant practices of digging, trenching, paving, over-building, burying underground utilities, etc., that are the hallmarks of our over-developed and highly fragmented suburbs and neighborhoods. When one sees an oak with significant crown dieback or that is dead, almost always is evidence nearby of a recent curb or driveway paving, re-grading or re-contouring the ground near the roots, trenching into the root zone, chemicalizing of lawns, encroachment from infill construction (very little surface area is left for rainwater infiltration), etc. In short, the climate-induced effects of drought are the knock-out blows in the death of the tree. Consequently, these stressors make them susceptible to secondary effects such as the two-lined chestnut borer and various root rot organisms and canker diseases. Water trees during seasonal droughts – we’re in one now and have been each summer, usually accompanied by record heat, since the late 1990s. In effect, this recent pattern of summer and early fall drought has disrupted rainfall patterns, resulting in an approximation of a rainy season-dry season regime. Whether or not this phenomenon is normal for the region or is an effect of climate change is unknown. It is crucial that we greatly amend and improve inadequate existing tree preservation regulations at the legislative level if we are to effectively retain our native oak-dominated canopy and old-age remnant trees throughout the region. Otherwise, infill development will destroy most of them (take a drive along Williamsburg Blvd. and side streets in N. Arlington and see the recent and unnecessary losses of old-age Black, Southern Red, and White oaks – one healthy, giant Black Oak overhanging Williamsburg Blvd. was even in a “tree save area” and was still very recently cut down and stump-ground!). Extensive construction and infill practices in urban areas severely fragment aquifers and lower natural water tables, creating virtual deserts and greatly reduced groundwater reserves for existing trees and vegetation. 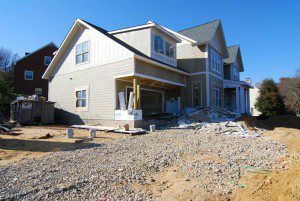 Modern construction practices unnecessarily ruin existing soils by using much of the site as a staging area, importing large amounts of artificial and non-biodegradable material, burying construction debris and refuse on site, compacting soils, and destroying beneficial soil microorganisms. 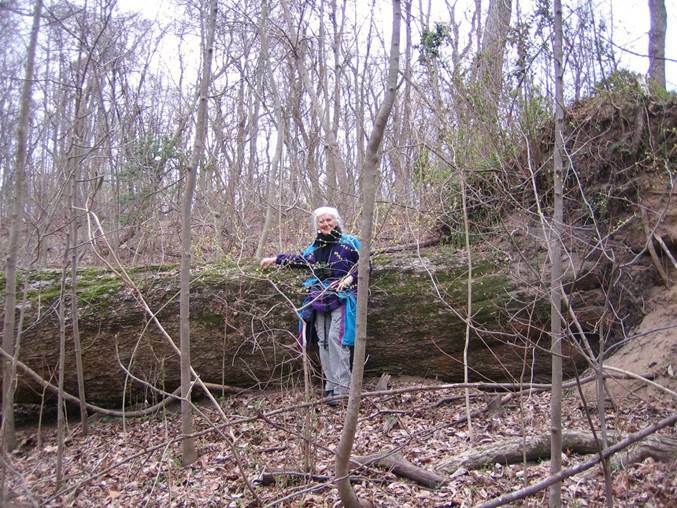 Bonnie Bick and former State Champion Chinquapin Oak (Quercus muehlenbergii) at Chapman State Park that was blown down by unusually high winds in late winter that followed unusually heavy, concentrated rainfall over the preceding several months. 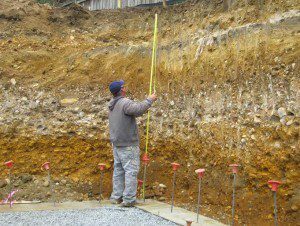 Tony Fleming, Licensed Professional Geologist: “Local environmental change is a well-documented culprit in plant and animal mortality, and it comes in a variety of packages, large and small. 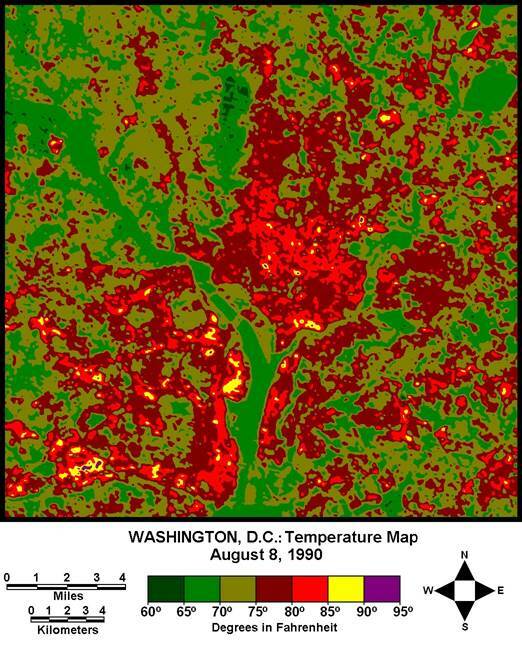 To my thinking, the most pervasive form of local environmental change is deforestation and urbanization: the Washington metropolitan area probably has considerably fewer forested areas now than 50 or 100 years ago. Regional deforestation creates a hotter, drier, and more wind-prone microclimate, not to mention less overall soil moisture availability as forested areas are converted to urban land cover. For the large trees that remain, the cumulative effect of all these local environmental changes amounts to death by 1,000 cuts. Old-age White Oak (Quercus alba) trees at the historic Alcova estate in Arlington County, Virginia exhibiting signs of severe crown dieback – likely the result of a fragmented and greatly diminished water table, numerous, consecutive years of extreme drought and heat, and possible damage to the root systems. 1. Climate change undoubtedly is occurring and almost certainly has a significant man-made component. One slam-dunk anthropogenic driver is changes in atmospheric chemistry. Since regular measurements began in the late 1950s, carbon dioxide levels have risen from roughly 300 parts per million to now over 400 PPM. The increase tracks closely with increases in fossil fuel burning. We know CO2 is a powerful greenhouse gas that will tend to force warming. Most scientists agree that we already have seen significant warming, some places more so than others, of course. Significantly, most climate models forecast a disturbing pattern change in precipitation patterns where we will see more intense droughts, punctuated by severe flooding episodes. I will argue that we already have seen exactly that pattern locally. Consider the June 25, 2006 flooding that some called a “200-to-500-year flood” and the recent tragic flooding that hit Ellicott City, MD. It would be very interesting to do a detailed analysis of DC precipitation records to look for proof of the pattern change… I have to believe that the overall changes in rainfall patterns, combined with warming, are very stressful for our trees. 2. Since we know we have much higher atmospheric CO2, we can conjecture that it could in itself be a stressor for trees, perhaps both directly, and likely indirectly by affecting pathogens, herbivorous insects, and beneficial microorganisms. 3. Even though the “acid rain” crisis seemed to have been solved years ago by substantial real reductions in sulfur compounds going into the air, mostly from coal plants, there still are high quantities of nitrogen oxides (“NOx”) going into the air, and that in turn leads to significant deposition of nitrates back to the land and waters. In fact, a few years ago, it was estimated that 25% of the nitrogen nutrients going into Chesapeake Bay were coming directly out of the air. Nitrate deposition remains relatively high, meaning that all our ecosystems are being over-fertilized even if we aren’t intentionally adding fertilizer. I am willing to bet, although I can’t prove, that the excess nitrogen is stressing our oaks. Good points, Steve! Thanks very much for your comment. I passed your piece onto Alice Nicolson who, until a few years ago, lived in Alcova. She wrote back that the tree in your picture that had a lot of dead branches on it had since died. Thanks for letting us know, Bob. Sorry to hear it.